Got hungry little tricksters to feed at Halloween? Get ready for an invasion of tasty treats from the Hallmark kitchen. 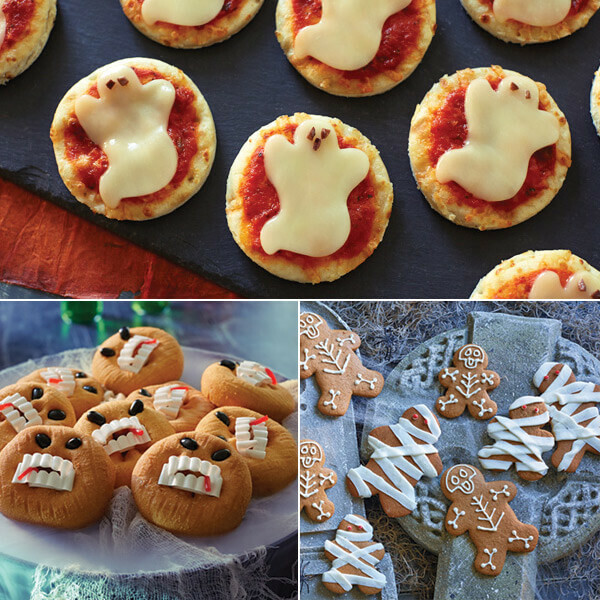 Our creeptastic cohorts have conjured a variety of scary good recipes to get everyone in the spirit—from a frightful meal of Ghost Cheese Pizzas to wickedly delicious Pretzowl treats. Want more Halloween food fun? Check out our Halloween monster cupcakes and gobblin’-good Halloween party recipes to find even more scares to share. You don’t need a complicated spell to conjure this wicked mix of sweet and salty. Just some premade snacks and a handful of crunchy little witch hats are all you need. Whoooo’s hungry? Make these adorable creatures of the night in minutes with a few easy-to-find ingredients. Peanut butter and chocolate get all crunchy and crawly. Monster hordes approaching—everybody get ready to demolish them! We used packaged gingerbread cookie mix to make all three of these tasty menaces. The treats that bite back! Use plain cake doughnuts, plastic fangs, red gel frosting (to make them creepier) and black candy eyes to create these horrid little faces. Then chomp away! All you need to create these spooktacular mini pizzas are some refrigerated large flaky biscuits, a jar of pizza sauce and slices of mozzarella. Pull apart the biscuit layers so each pizza crust is ⅓ to ½ of a biscuit. Add a spoonful of sauce. Then, use a cookie cutter to cut ghostly slices of mozzarella to cover the tops. (We added bits of chopped black olives for the ghosts’ eyes and mouths.) Bake according to the directions on the biscuit can.